Harold was a 22 year old labourer on ‘Euronga’, Gilgandra NSW when he enlisted on October 9 1915 at Gilgandra. He was 5’9” tall, weighed 11 stone (69kgs), with medium dark complexion, blue eyes, dark hair and a vertical scar near his ankle on his left foot. He was Methodist and his next of kin was his mother who lived in Essex, England. Harold trained at Liverpool and embarked from Sydney to Egypt aboard HMAT A15 Star of England on March 8, 1916 with the 13th Battalion. 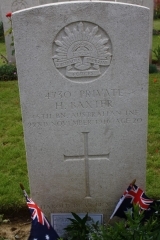 Harold transferred to the 45th Battalion and left Alexandria for Marseilles, France, and arrived at the Western Front in June 1916 to face the Battle at Pozieres in August 1916. 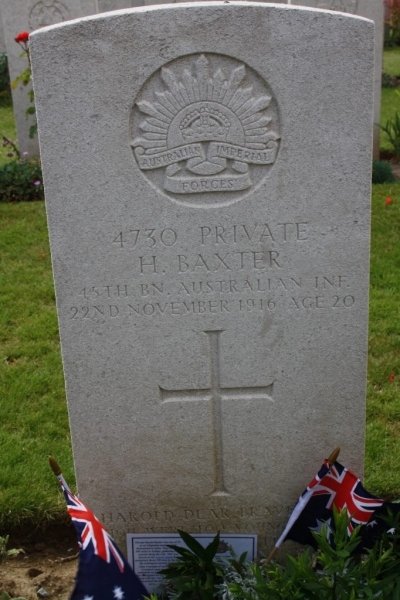 Harold’s brother, Herbert Baxter enlisted from Gilgandra in August 1914 with the 1st Light Horse and survived Gallipoli and the Western Front. Their great niece, Elaine addresses the schoolchildren of North Narrabeen each year and proudly tells the stories of these men.